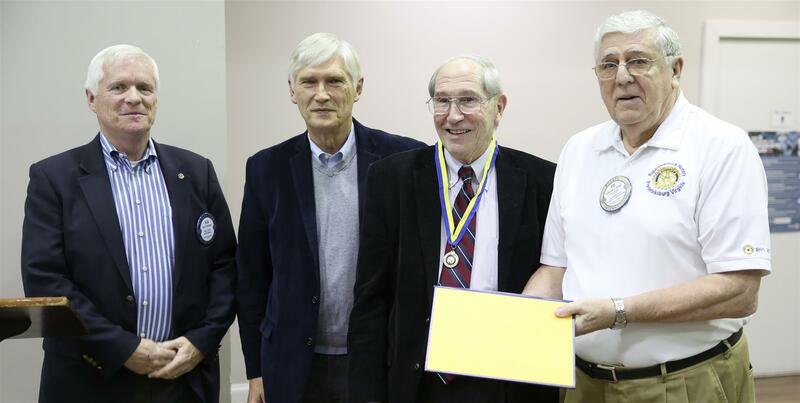 Allen Harrison, Owner and President of Battlefield Homes, Fredericksburg, was presented the 2018 Ethics in Business Award on June 27th at the annual installation banquet for the Rappahannock-Fredericksburg Rotary Club. This award is given annually to a local business person who demonstrates the highest ethical standards in his or her business practices and adheres to the Rotary Four-Way Test. Harrison was recognized for his honesty, integrity and the way he treats his customers in a fair and caring manner. In addition to receiving the ethics award, Harrison was named a Paul Harris Fellow, which carries a $1,000 donation in his name toward the eradication of polio, production of clean water and the promotion of peace worldwide. Keith Wampler, John Coker, and Blanton Massey. Ann Jurczyk, Virginia Outreach and Advocacy Manager for the Chesapeake Bay Foundation's Richmond office, spoke to RRC members on the Chesapeake Clean Water Blueprint and treated club members to wonderful photos and good news about the work being done to reduce pollution and restore local rivers and the Bay. The number of female crabs is up, oysters are rebounding, and underwater grass beds have hit record levels in each of the last four years. The Rappahannock-Fredericksburg club sent a team of Rotarians to El Progreso, Honduras earlier this year to build a Habitat for Humanity house. Member Dietmar Weslin stayed in the home of Dr. Nardelio, a member of the El Progreso Rotary Club. While there, Dr. Nardelio shared with Dietmar their hospital's need for a medical ventilator. Dr. Nardelio estimated that between 35 and 40 lives could be saved annually by having this device. 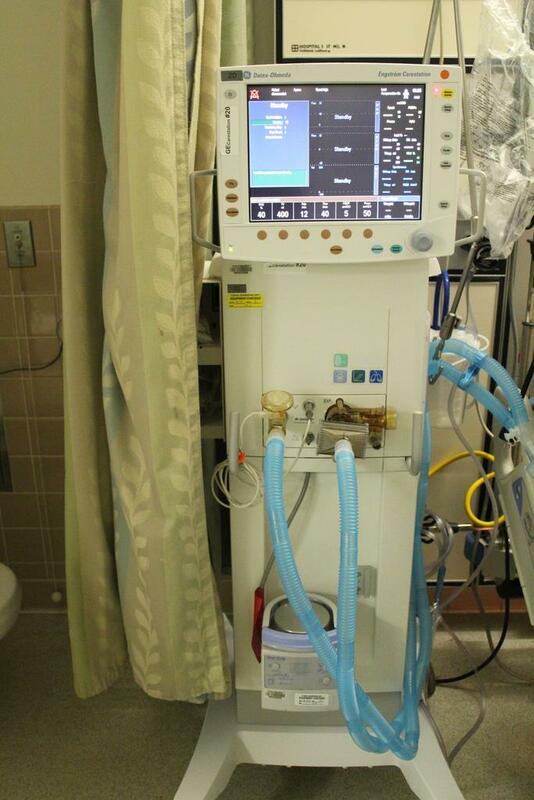 Thanks to Mary Washington Hospital's generosity, Dietmar, along with member Fred Rankin, secured a donated ventilator. Club member Tom Carlson, team leader for the mission trip, shipped the ventilator to Dr. Nardelio on the 18th of July. Recently we welcomed two new women members to the Rappahannock Rotary Club. It has only been a little over twenty years since women were first welcomed into Rotary. The 1989 Council on Legislation vote to admit women into Rotary clubs worldwide remains a watershed moment in the history of Rotary. 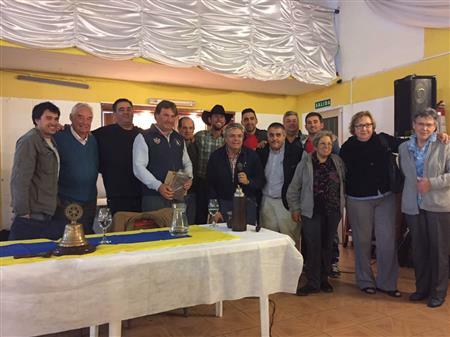 The Rappahannock Rotary Club's International Service Committee remains actively involved in several impactful projects, all aimed at improving the quality of lives around the globe. Click the link to learn about how we are building homes for families in Honduras, providing computers for students in Belize, delivering neo-natal hospital equipment in Jamaica, and more. The Rotary Foundation, the charitable arm of Rotary – a global network of volunteers committed to improving lives and communities around the world, has been named the 2016 Outstanding Foundation by the Association of Fundraising Professionals (AFP). Club members experienced the wisdom of over 42 years of medical experience as Dr. Frank Marks spoke March 23rd on the symptoms and treatment of cognitive disorders in the elderly. In case you may have missed this from the most recent issue of The Rotarian, there was mention that The Rotary Foundation earned another four-star rating from Charity Navigator. 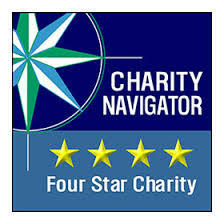 Charity Navigator is the largest and most prestigious independent evaluator of non-profits in the United States. This marks the eighth year in a row that our Foundation has been recognized with four-stars. This, by the way, puts The Rotary Foundation in the top 2% in non-profit charity organizations. This is why The Rotary Foundation is my charity of choice and I hope yours as well. In 2006, ten members of the Rappahannock (RRC) and Stafford (SRC) Rotary Clubs departed for El Progreso, Honduras. 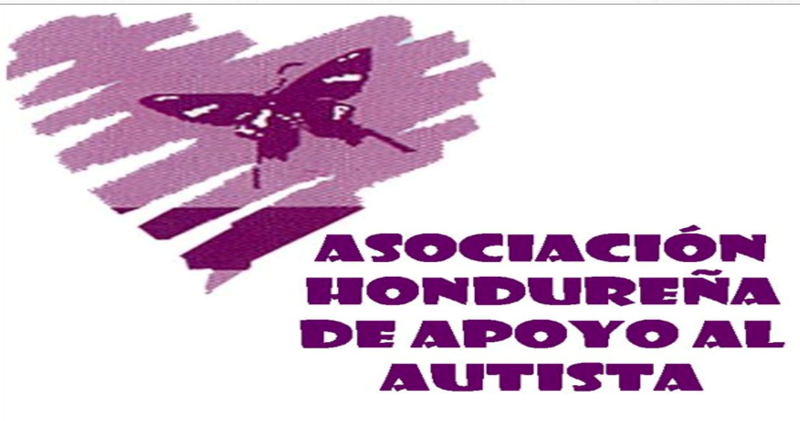 With about $5000 in hand donated by our two clubs and the Fredericksburg (FRC) club, we rehabilitated 22 lean-to homes in Siete de Abril, and we financed the building of a two stall bathroom next to the school there. 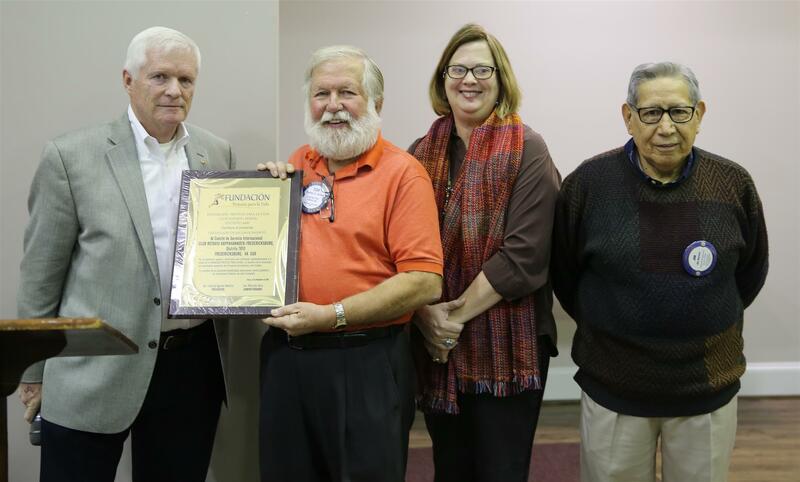 Rappahannock Rotary members welcomed Dr. Roberto Castellanos Madrid, who spoke on treating children diagnosed with Autism Spectrum Disorder in Tegucigalpa, Honduras. The purpose of the Rotary Leadership Institute (RLI) is to strengthen the Rappahannock Rotary club and strengthen each member's life. Rotary provides an opportunity for all of us to provide service to our community and throughout the world. 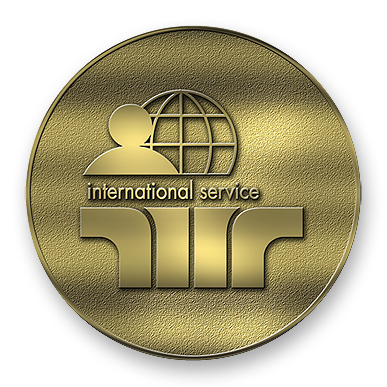 (Service Above Self) With that service comes a learning experience in the areas of leadership, team building, planning, marketing, communication and organization. 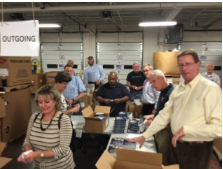 Thanks to the crew in the photo, the dictionaries are all labeled and ready for distribution. We will also be supporting the Book Buddy program at Lafayette Upper Middle School again this year, starting November 10. 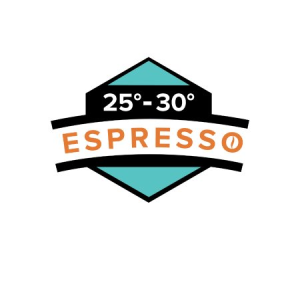 Mentors will meet on the stage in the cafeterium at 8 am (actual time this year) and have students who need a little extra work read to them. The program runs from Tuesday through Thursday and ends at 8:25. Would you be willing to donate one hour (2 visits) per month to help a third grader become a better reader? As many as 20 Rotarians and spouses supported the program last spring and we hope to have similar support this year. If interested, please contact Mark Steele at mark@thetitleprofessionals.com or 540.310.4804. 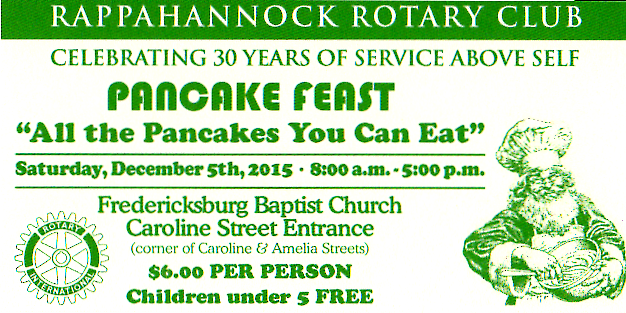 Make plans to spend the day in beautiful downtown Fredericksburg on Saturday, December 5th, starting with an all-you-can-eat meal of pancakes, sausage, baked apples, and beverages at Fredericksburg Baptist Church. Whether you come for breakfast, lunch, or an early "dinner", there are plenty of holiday activities to enjoy. Featuring live entertainment, visits with Santa, and fun activities for children, this year's event promises to be one of the best ever. Afterwards, go shopping, spend time with friends and family, or watch the annual Christmas parade. Tickets can be purchased in advance from a club member or at the door. 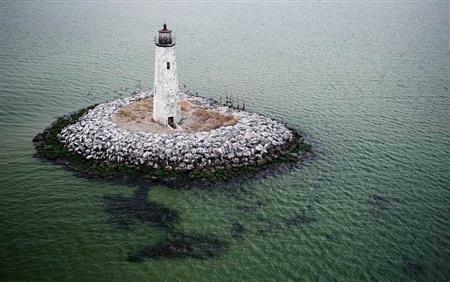 All materials and photos, unless otherwise specified, copyright of Rotary club of Rappahannock-Fredericksburg.